Will India test their bench strength before the bigger challenge against England? In Today’s Dream11 Fantasy Cricket Match Prediction of IND vs IRE 2nd T20, we will cover Probable Playing 11, Pitch Report of The Village, Dublin, Toss Prediction, Who Will Win and Fantasy Cricket News. Who Will Win the 2nd T20I Match, Between IND vs IRE and Toss Prediction? Where Can You Watch the Live Streaming of IND vs IRE, 2nd T20I or Channels to Watch? What is the best combination of players for Dream11 and Fantasy Leagues for 2nd T20 Match? India will definitely try to test their bench strength and their main focus will be on the upcoming series against England. Men In Blue completely out played Ireland in the previous match and they will try to make it 2-0. On the other hand, IRE failed to play the spinning duo of IND. According to our astrology prediction, IND will win today. The winning the toss should opt to bowl first as chasing will be an easy job. The decision of batting or bowling first will definitely not affect India Team. according to ur astrology prediction IND will win the toss and ask IRE to bowl first. Date: The match will be played on 29th June 2018 (Friday). 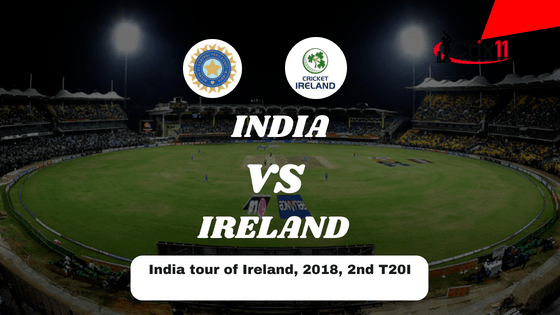 Match: 2nd T20I, India Tour of Ireland, 2018, IRE vs IND. Time: 03:00 PM GMT, 08:30 PM IST. The pitch of Dublin, The Village will behave the same way it did the other day. The pitch is going to be flat and the spinners will be benefited. The Indian spinners will take maximum benefit from the wicket. The batsmen will enjoy batting on this ground and a high score is expected. The weather will be no different from the other day. It will be a sunny day. The sun will be out throughout the day and the sky will be clear. The cricket fans and fantasy users can get the complete game as no rain is expected. The temperature is expected to be 22-Degree Celsius and the humidity to be 41%, which may increase up to 74%. Note: Due to the sunny weather the batsmen will be some help from the wicket and spinners will also get help from the pitch. The weather condition will dry the pitch due to which more turn from the spinners can be seen today. The average first inning score of this ground is 137. The average second inning score of this ground is 127. Highest total on this ground is 208/5 in 20 overs by IND vs IRE. Lowest total on this ground is 93/10 in 19.4 overs by NEP vs PNG. Note: If you have the details of scoring pattern then you can get a fair idea of the scores, the team can make. India and Ireland have played two games against each other. IND has defeated Ireland in both of the games. In the last encounter, India has defeated IRE by 76 Runs. Ireland vs India, two-match T20I series will be broadcasted on Sony Six and Sony Six HD. Sony Six and Sony Six HD has all the exclusive right to broadcast the live coverage in India and its Sub-Continent like Bhutan, Sri Lanka, Bangladesh, Maldives, Nepal, Afghanistan and Pakistan. SonyLiv digital platform and its website and app will broadcast the live streaming of the match. Kohli has already indicated that he will rotate the players to test the bench strength before they face a bigger challenge against England. It expected that India can make 3 or 4 changes in their team. KL Rahul has a high chance of playing in place of Rohit Sharma. Umesh Yadav may play in place of Jasprit Bumrah as he is not 100% fit. Shikhar Dhawan, Suresh Raina, Manish Pandey/Dinesh Karthik, Bhuvneshwar Kumar/Umesh Yadav, Yuzvendra Chahal, KL Rahul, Virat Kohli (capt), MS Dhoni (wk), Hardik Pandya, Kuldeep Yadav, Jasprit Bumrah/Siddarth Kaul. Shikhar Dhawan, Siddarth Kaul, Yuzvendra Chahal, Dinesh Karthik, Jasprit Bumrah, Virat Kohli(c), Suresh Raina, Bhuvneshwar Kumar, Manish Pandey, Rohit Sharma, Kuldeep Yadav, Umesh Yadav, MS Dhoni, Washington Sundar, Lokesh Rahul, Hardik Pandya. Josh Little has been ruled out of the series because of injury and David Delany has been called in place of Little. IRE team management may bring a spinner. Andy McBrine may play in place of Stuart Thompson. James Shannon, Boyd Rankin, Paul Stirling, George Dockrell, Kevin O’Brien, Peter Chase, Gary Wilson (C), Andrew Balbirnie, Stuart Poynter (WK), Simi Singh, Stuart Thompson/Andy McBrine. George Dockrell, Stuart Poynter, James Shannon, Stuart Thompson, Boyd Rankin, Peter Chase, William Porterfield, Gary Wilson(c), Simi Singh, Andrew Balbirnie, Kevin O Brien, Andy McBrine, Paul Stirling. The below-mentioned players are the most important players for fantasy cricket leagues like Dream11 and Myteam11 or any Fantasy Leagues you play. We have divided the key players in three section that is wicket keepers, batsman, all-rounders, and bowlers. All the players selected in this section are on the basis of their recent performance. You can make your perfect team for dream11 from the list. Fantasy Cricket Expert Tips: You can choose Dhoni above Poynter but keep in mind that Dhoni may not get a chance to bat. 74.99% of the users have selected MSD in their Dream11 Fantasy Cricket Teams and 25.01% of the users have selected Stuart Poynter in their dream teams. Make a combination of the above players for multiple teams. Fantasy Cricket Expert Tips: The above batsmen are most likely to score runs today. Make a combination of the above players for multiple teams. Fantasy Cricket Expert Tips: The above all-rounders has a high chance of contributing today. Make a combination of the above players for multiple teams. Fantasy Cricket Expert Tips: The above bowlers are most likely to take wickets today. Make a combination of the above players for multiple teams. Fantasy Cricket Expert Tips: The above players are most likely to perform today. You can take them as a captain and vice-captains. You can also take captains from key players. Fantasy Cricket Expert Tips: The above players are most valuable players according to Dream11 Guru. You can take them as a captain and vice-captain. This team is a Demo team, although you can keep this team in your small leagues. For better and accurate results make your own team from the above data and statistics. Note: The team may be updated before the deadline. Make sure to subscribe to our notification to get real-time details. You can also like our Facebook Page to get details live. Note: To win every match play in small leagues. The wicket will play almost the same, it did the other day. Tr to keep top order batsman from India. Taking Yuzvendra Chahal and Kuldeep Yadav in your team will be a wise decision. Try to take fewer players from IRE. Note: This is our prediction for today’s match. This is just for entertainment purpose. We don’t support any kind of betting. Conclusion: This is it for Today’s Dream11 Fantasy Cricket Match Prediction of IND vs IRE, 2nd T20I Match, which will be played on Friday 29th June. We have covered all the details required to win any fantasy leagues. We have covered players recent and past performance, dream11 guru and crictom prediction, all the latest news and updates of India Team and Ireland Team, weather report of Dublin, dream 11 best teams, keys players, the best choice for captain and vice-captain, where to watch the live match of IRE vs IND, 2nd T20 Match and the details of live streaming of India Tour of Ireland, 2018. You can give your valuable feedback in the comment section. Subscribe to our notification of latest updates. GOODBYE! Note: The above details are very important. If you ask any fantasy cricket experts. They will give you the same answer. Luck plays an important role. Fantasy Cricket is a game of skills and your skill part is covered in this post. Crix11 So very Good Side Very Motivated and So Very knowledgeable this Side Make the Team Am So very Impressed this Side Thank you So Much keep Going..